Craniopharyngioma may cause hydrocephalus by physically obstructing CSF pathways or altering CSF content but has not previously been reported to cause increased CSF production. When CSF production is greatly increased in a young child, diversion and absorption of CSF can become problematic. Placement of the distal shunt catheter in the pleura, gallbladder, stomach, ureter, and Fallopian tube More Details have all been reported following failure of peritoneal shunting. However, in this case neither the gallbladder nor the peritoneum was capable of absorbing the quantity of CSF being produced, and an atrial catheter was required. A 1-year-old girl presented with a 7-day history of irritability and acute visual deterioration. Imaging revealed a calcified cystic suprasellar mass [Figure 1]. She underwent emergent endoscopic fenestration of the cyst with insertion of an ommaya reservoir to decompress the visual apparatus and ventricular system. Endoscopic biopsy of the lesion was undertaken at the same time, and a grade I adamantinomatous craniopharyngioma was diagnosed. Postoperatively, she developed a persistent CSF leak through her wound requiring insertion of an external ventricular drain (EVD). It was necessary to drain 40-50 mL/h of CSF to prevent symptoms and allow wound healing. CSF was sterile after 48 h culture with a white cell count of 8 cells per microliter and a red cell count of 550 cells per microliter. Endoscopic third ventriculostomy was not feasible so she underwent ventriculoperitoneal (VP) shunt insertion and debulking of the craniopharyngioma [Figure 1]. After multidisciplinary team discussion she travelled to the USA for proton beam therapy to the residual tumour. She had been experiencing intermittent abdominal pain and distension and while in the USA she developed symptomatic CSF ascites with CSF demonstrated in all four quadrants of the abdomen on ultrasound scanning. The unit she attended in the USA preferred to use ventriculogallbladder shunts when the peritoneum could not be used,  and the VP shunt was revised to a ventriculogallbladder shunt with resolution of her ascites. At nearly 2 years old, she developed a new craniopharyngioma cyst and underwent repeat endoscopic fenestration with Ommaya reservoir insertion. Postoperatively, she again developed a persistent CSF wound leak. This was associated with a distended, tender abdomen. Abdominal computed tomography showed a markedly dilated gallbladder [Figure 2]. It was clear that the accumulation of CSF within the gallbladder was preventing the shunt from functioning at its maximum capacity. At this time, she had no ascites so the distal shunt catheter was revised to a peritoneal catheter. The VP shunt allowed wound healing but within a month the CSF ascites had recurred [Figure 3], and the peritoneal catheter was revised to an atrial catheter. Six months after insertion of the ventriculoatrial shunt, she remains asymptomatic. This case demonstrates the difficulty in choosing a distal catheter site for a young child producing a large volume of CSF. Average rates of CSF drainage in children requiring an EVD or shunt externalization are 6-8 ml/h. CSF ascites occurring after VP shunt insertion has been attributed to increased CSF production, decreased peritoneal absorption, increased protein content, infection, and malignant seeding to the peritoneum. In this child with no previous abdominal conditions and consistently sterile CSF with normal cell counts, the development of CSF ascites and gallbladder distension is likely the result of a massive increase in CSF production. Even if absorption of CSF was compromised, drainage of 40-50 ml/h of CSF consistently over a week of external drainage suggests CSF overproduction. Increased CSF production leading to shunt complications has not previously been reported in children with craniopharyngioma. 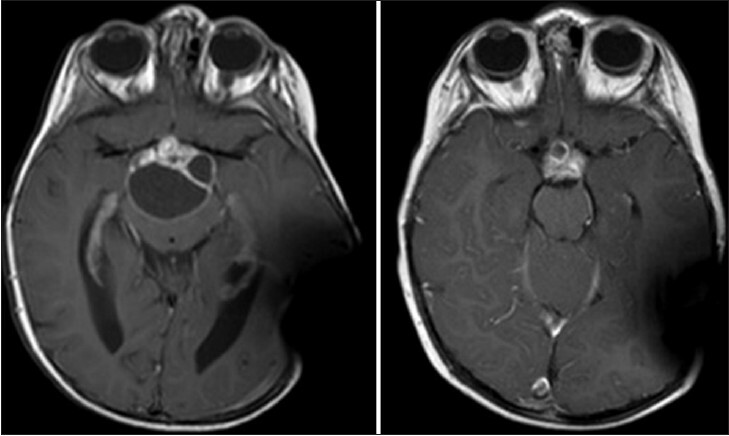 CSF ascites due to elevated CSF protein levels occurred in one case of craniopharyngioma requiring conversion of the VP shunt to a ventriculoatrial shunt. However, following resection of the craniopharyngioma, the CSF protein content decreased and a VP shunt was reinserted without complication. Abdominal pseudocyst and CSF ascites resolving with revision of the peritoneal catheter and ascitic taps have also been reported in children with craniopharyngioma. , However, in neither of these cases was the volume of CSF produced significantly increased. Craniopharyngioma cyst content differs from that of CSF  and it is possible that release of cyst fluid into the CSF has the potential to cause an aseptic meningitis, leading to increased CSF production or poor absorption of CSF. However, it is unlikely that this process would continue over the course of a year with normal cell counts and sterile CSF. Ventriculogallbladder shunts have been described as alternatives to VP shunts in children with ascites, peritonitis, abdominal adhesions, or multiple previous intraabdominal procedures, where VP shunts are either not possible or have failed. , The unit where this child received proton beam therapy has had a very successful experience of gallbladder shunts in children with multiple previous shunt failures. However, gallbladder distension and atony are known complications of ventriculogallbladder shunts. 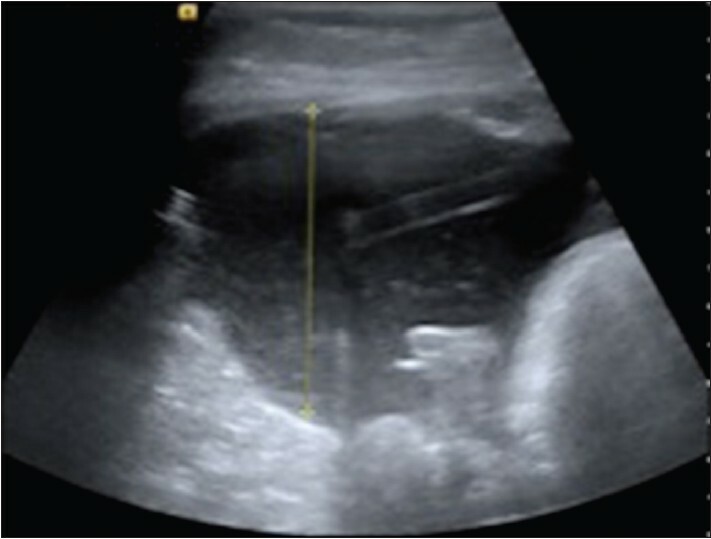 Due to the young age of this child, the gallbladder may not have had sufficient surface area or absorptive capacity for the volume of CSF requiring absorption. In cases where peritoneal absorption has failed due to large volumes of CSF, the gallbladder may not be a suitable alternative. A pleural shunt was not considered due to the significant risk of respiratory compromise in a young child producing large volumes of CSF. Hence, a ventriculoatrial shunt was inserted. Even with the repeated need to lengthen the distal catheter in a child of only 2 years old, the venous circulation was felt to be the only distal site capable of receiving the large volume of CSF. VA shunts should be considered when large volumes of CSF require drainage. This case demonstrates that in very young children with craniopharyngioma, a process resulting in excessive production of CSF may occur, and a ventriculoatrial shunt may be necessary if other distal catheter sites fail to provide sufficient CSF absorption. 1. West KW, Turner MK, Vane DW, Boaz J, Kalsbeck J, Grosfeld JL. Ventricular gallbladder shunts: An alternative procedure in hydrocephalus. J Pediatr Surg 1987;22:609-12. 2. Aldana PR, James HE, Postlethwait RA. Ventriculogallbladder shunts in pediatric patients. J Neurosurg Pediatr 2008;1:284-7. 3. Yasuda T, Tomita T, McLone DG, Donovan M. Measurement of cerebrospinal fluid output through external ventricular drainage in one hundred infants and children: Correlation with cerebrospinal fluid production. Pediatr Neurosurg 2002;36:22-8. 4. Adegbite AB, Khan M. Role of protein content in CSF ascites following ventriculoperitoneal shunting. Case report. J Neurosurg 1992;57:423-5. 6. Ohaegbulam SC. Cerebrospinal fluid ascites complicating a ventriculoperitoneal shunt. Int Surg 1980;65:455-7. 7. Arefyeva IA, Semenova JB, Zubairaev MS, Kondrasheva EA, Moshkin AV. Analysis of fluid in craniopharyngioma-related cysts in children: Proteins, lactate and pH. Acta Neurochir 2002;144:551-4.